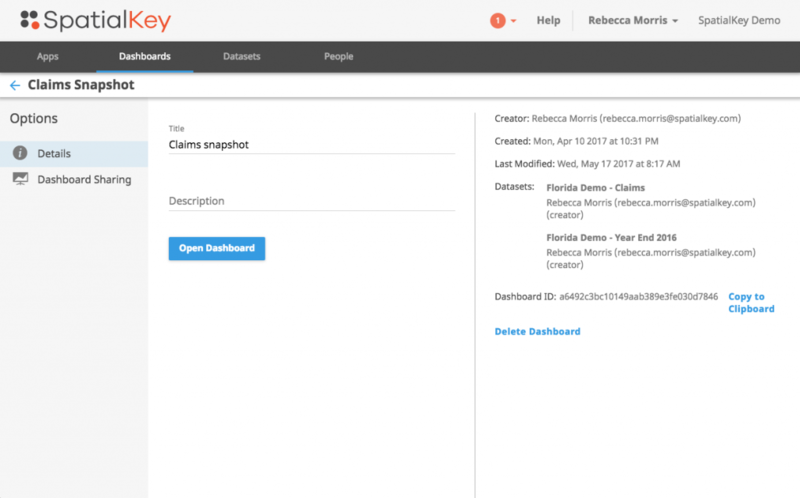 The home interface of SpatialKey is very intuitive and easy to navigate, but for first time users, a quick walk-through wouldn’t hurt. At the top of the screen above the toolbar, you can view notifications, get help, or log out of SpatialKey. You will receive notifications when processes finish, for example, when a dataset has finished importing and is ready for use. Clicking on “help” will link you to our support content, frequently asked questions and also provide a quick way to submit some feedback directly to us. 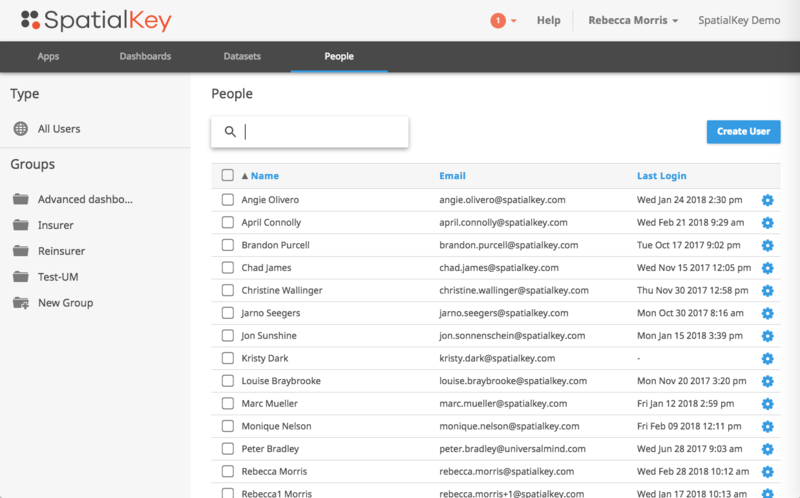 You can also click on your name to view your profile or log out of SpatialKey. In your profile (accessed by clicking on your name in the SpatialKey header), you have access to edit your information, view API information, and view account quotas. The API Access tab has useful information if you want to set up any APIs for your organization and want to authenticate in with your user information. The quotas listed are for your entire organization and are not user-specific. Let’s continue to walk through the different tabs on the toolbar. If you would like a cheat sheet, check out Navigating SpatialKey in the Quick Start Guide. When you first open SpatialKey, you are defaulted to the Apps tab. From here, you can quickly launch apps. If you have any favorite dashboards, they will appear in the right panel for quick access. After selecting an app, you will be walked through a few simple steps to select your data and create your dashboard. 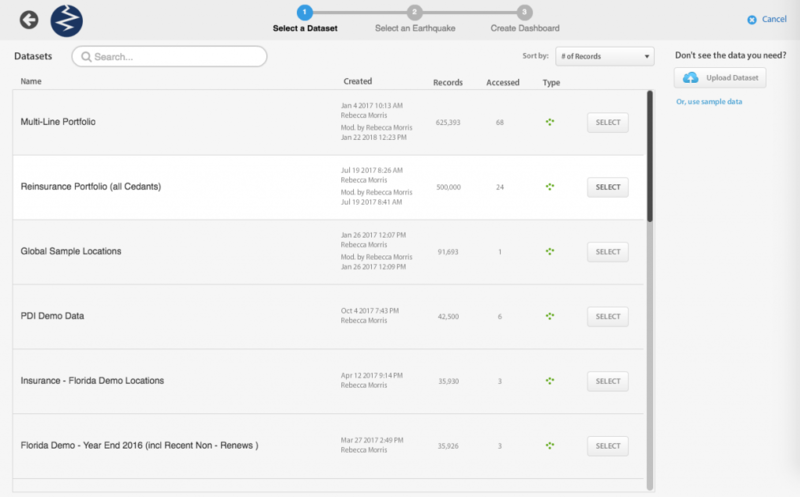 For example, when selecting the Earthquake app, you will be walked through 3 steps in order to launch your dashboard. In the dashboards tab, view and manage saved dashboards/reports across all applications. These could be dashboards that you saved (by default you are the dashboard owner), dashboards for which you have been given owner privileges, or dashboards that other users have shared (and you have access to all underlying data). In the left panel, there are options to help you filter the dashboards to find what you are looking for. 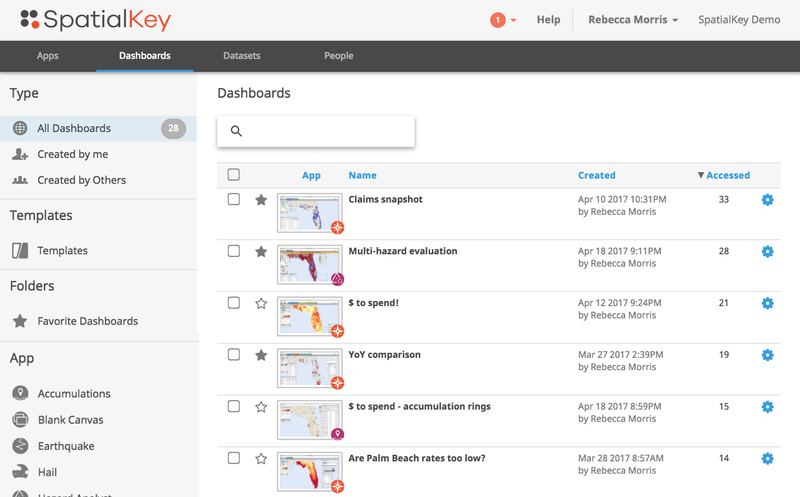 You can filter by dashboards that you created, dashboards that have been shared, or filter dashboards by the app they were created with. Also, don’t forget to identify your favorite dashboards so you can quickly locate them – simply click the star next to the dashboard you want to flag as a favorite. Favorite dashboards appear on your apps homepage for quick reference. Click on “settings” (gear icon) to manage a dashboard. Details – the details tab provides all information about the dashboard and provides the ability to delete the dashboard. Dashboard Sharing – the dashboard sharing tab allows dashboard owners to make a dashboard shared or private and manage who can see the dashboard. Some of these options may not be available to you for all dashboards depending on your permissions. 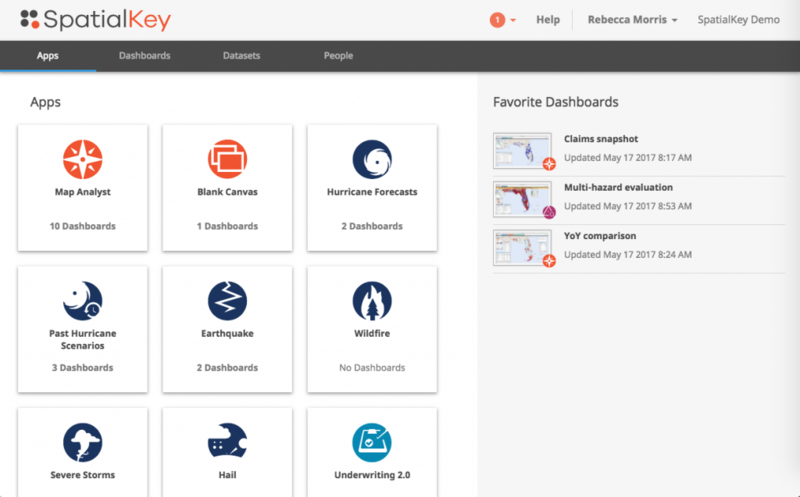 For details on which options are available based on your permission level for a dashboard, check out this article on Sharing Data and Dashboards. In the Datasets tab, you will find all data that you have imported or have been given permission to. 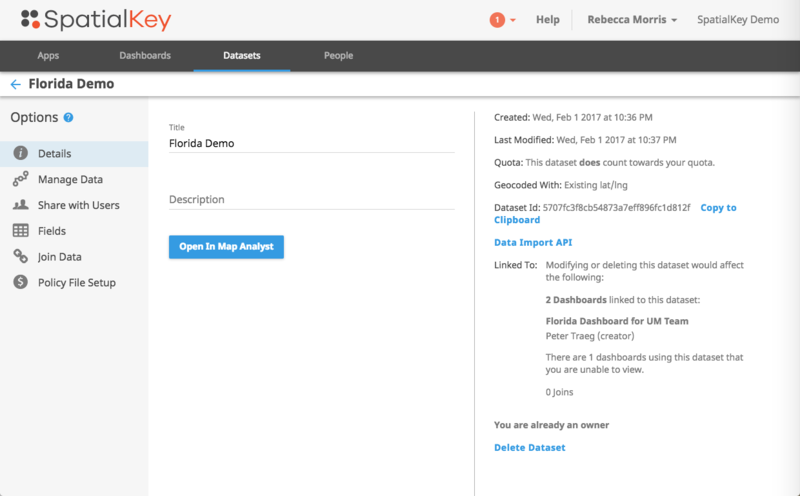 Click on the “upload new dataset” button to bring more data into SpatialKey. For more details, check out this article on Importing Your First Dataset. Note that you will not see the “upload new dataset” option if you don’t have permission to upload data into your SpatialKey organization. Use the filters in the left panel to filter your list of datasets by type to help find what you are looking for. 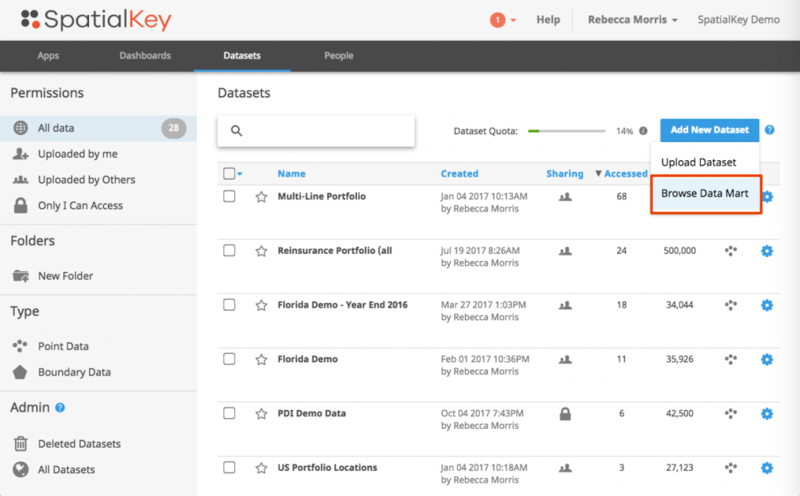 You can also create custom folders in the left panel to help you organize your datasets. Also, don’t forget to identify your favorite datasets so you can quickly locate them in the “Favorite Datasets” folder in the left panel. Click on “settings” (gear icon) to manage a dataset. Details – the details tab provides information about the dataset and provides the ability to delete the dataset and open it in a dashboard. Manage data – the manage data tab provides a preview as well at the ability to export and change a dataset (append or replace). Share with users – the share with users tab allows users to manage permissions for the dataset. Fields – the fields tab provides a way to change field names and display format. Join data – the join data tab allows users to manage links between this dataset and others. Policy file setup – the policy file setup tab allows users to upload and identify associated policy information. Some of these options may not be available to you for all datasets depending on your permissions. For details on which options are available based on your permission level for a dataset, check out this article on Sharing Data and Dashboards. View all datasets for the organization, even those they don’t haven’t been given explicit permissions on. View datasets deleted within the last 48 hours with the option to recover them. 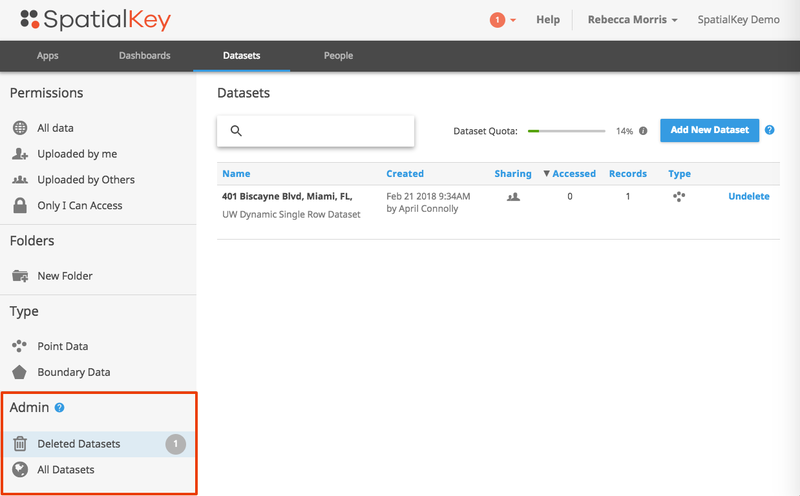 If enabled for your organization, you can view and select datasets to import and work with in SpatialKey from the Datasets tab. Datasets in the data mart are loaded with the purpose of being shared. If you have a dataset that is commonly used across your organization, e.g. US Census data, contact SpatialKey so we can load it into the data mart for you. Other users in your organization will be able to access and benefit from this data being available. 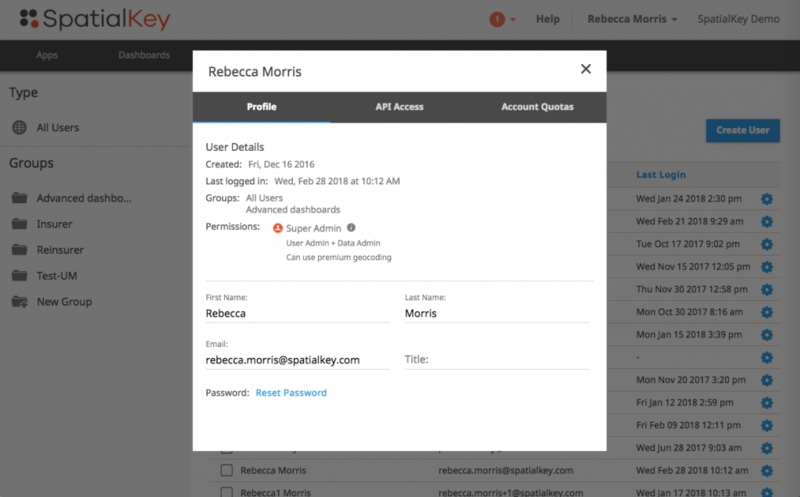 In the People tab, users with user admin permission can create users, manage permissions of existing users, and manage groups. Note that it is possible that your permission level doesn’t allow you to view the people tab in SpatialKey. 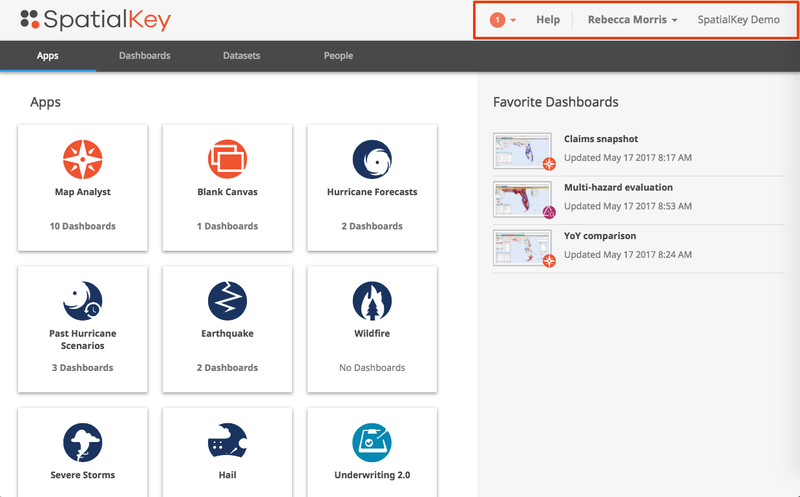 Viewer – A viewer can see dashboards and datasets that are provided by other users. They can also save dashboards, but cannot upload data or share with others. 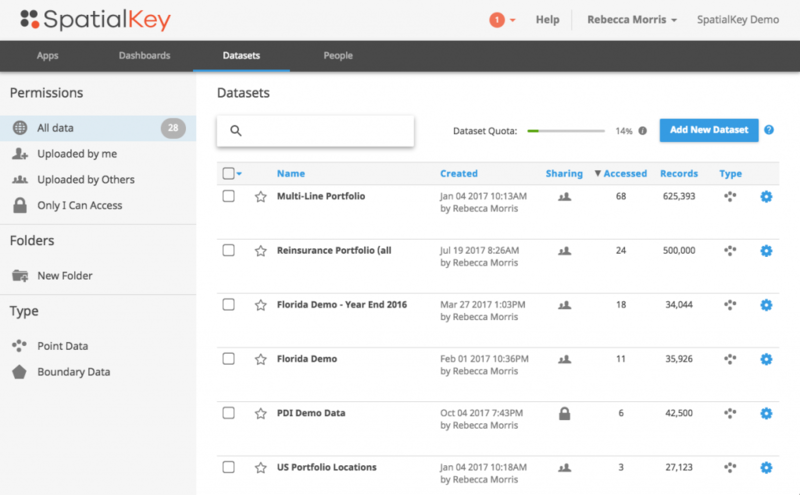 Collaborator – A collaborator can upload data, create dashboards and share these items with others. User Admin – A User Admin can do everything a collaborator can do PLUS they can create & manage users. Data Admin – A Data Admin can do everything a collaborator can do PLUS they have permission to take ownership of and delete any dataset in the system. Super Admin – A Super Admin can do everything a User Admin and Data Admin can do, with the added permission of access to organization API keys. This should only be given to users you want to have system-wide admin access. Click on “settings” (gear icon) to edit a user. The same options as above are available for editing – user name, email, and permissions. Click on the “new group” item in the left panel to add a new group. Click on “settings” (gear icon) next to the group name to edit or delete a group. To add a user to a group, click the checkbox for the user, and use the blue banner to add that user to a group. To manager users in a group, click on the group folder, select a user from the group, and use the blue banner to remove them from the group. Now that you are an expert at navigating the home interface, try Loading Your First Dataset or Opening Your First Dashboard.